A brief review on the occurrence of high natural concentrations of potentially toxic elements (PHEs) in soils and water is presented, analysing also various approaches and strategies applied in different Countries to address the problem of “natural” contamination. Starting from the well known case of arsenic, the situation for other elements such as beryllium, uranium and nickel, among the most interesting, is analysed. The analysis is based on already evidenced geochemical anomalies and on the possible evolution both in the estimate of their toxicological effects and the redefinition (lowering) of the limits at the moment imposed by legislation or suggested by guidelines. New data obtained in the ENEA laboratory in the last years on arsenic and beryllium are presented. The growing need of “geochemical maps” at regional, national and European level and of a continuous monitoring activity is highlighted. At the same time the importance of considering concentration and speciation of elements and how an element is bound and under what circumstances it may be bioavailable and able to damage the ecosystem, is recalled. Finally it is suggested to concentrate efforts on the development of screening methodologies that could play a key role in the characterisation of contamination and on standardising fast procedures that enable a guided real-time survey. The clear definition of a “geochemical risk” requires a complex and multidisciplinary approach, so the emerging role of Medical Geology is underlined. 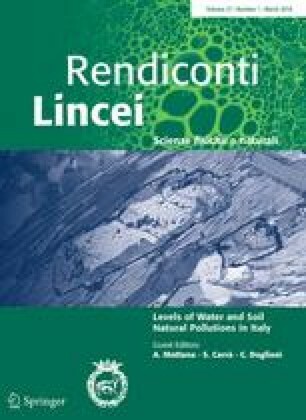 This contribution is the written, peer-reviewed version of a paper presented at the XV Giornata Mondiale dell’Acqua “Grado di inquinamento naturale di acque e suoli in Italia”, held at the Accademia Nazionale dei Lincei on March 20, 2015.